As we reported in yesterday's report on the 32312 zip code, NE Tallahassee is the busiest quadrant in the Tallahassee real estate market, having posted 52% of the home sales in 2014. Within this area, the neighborhoods in the 32309 zip code represent a healthy portion of the home selling activity, with an average home sales price of $237,851 and average value of $113 per square foot. Today's report covers home sales in the 32309 neighborhoods from January 1, 2014 through January 10, 2015, and shows key information for both home sellers and home buyers alike. The following real estate graph ranks the top 32309 neighborhoods, from left to right, based upon the number of homes sold over the past year. The black columns show the total number of homes sold (measured on the left vertical axis), while the red columns show the average sales price (measured on the right vertical axis). By way of example, Killearn Estates recorded 124 closed home sales at an average price of $227,305. Killearn Acres was the second most active neighborhood in the 32309 zip code, with an average sales price of $157,239 with 46 homes sold. I consider this one of the best bellwether subdivisions in Tallahassee, as it often sees its homes in line with the median price and value for our entire area. Arbor Hill shows up third on the list, with 18 homes sold at an average price of $112,581, followed by Shannon Forest with 14 homes sold at an average price of $189,968 and then Sawgrass Plantation rounds out the top five 32309 neighborhoods with 13 home sales at a $121,992 average home sales price. Current listings and the complete list of sales in the 32309 neighborhoods can be seen below. 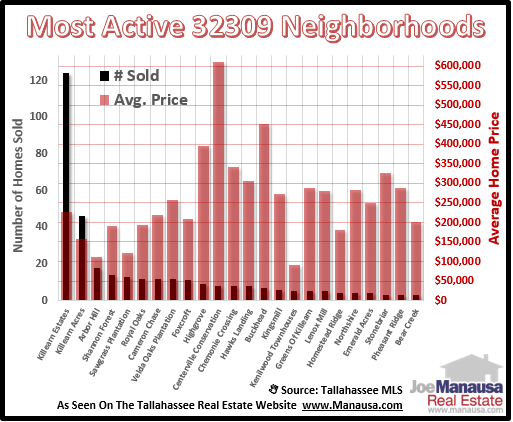 The follow table shows the total number of homes sold in each of the active 32309 neighborhoods from January 1, 2014 through January 10, 2015. I hope our report on the most active 32309 neighborhoods answered questions that you may have had, if not you can simply drop me a note with your unanswered question.